US monetary policy began to tighten in December 2015, with the Fed’s key rate moving from a target range of 0 – 0.25% to 0.75 – 1% in 15 months. To complement its monetary policy, the Fed also manages the size of its balance sheet, which is a result of programmes to purchase financial stock (also called quantitative easing programmes). The Fed’s balance sheet now comes to 4,400 billion dollars (26% of GDP), compared with 900 billion dollars in August 2008 (6% of GDP). The improvement in the economic situation in the United States and the potential risks associated with QE pose questions about the timing, pace and consequences of the normalization of this unconventional tool. The minutes of the meeting of the Monetary Policy Committee (FOMC) on 14 and 15 March 2017 provide some answers: the Fed’s procedure for reducing the balance sheet calls for not reinvesting the proceeds of securities arriving at maturity. 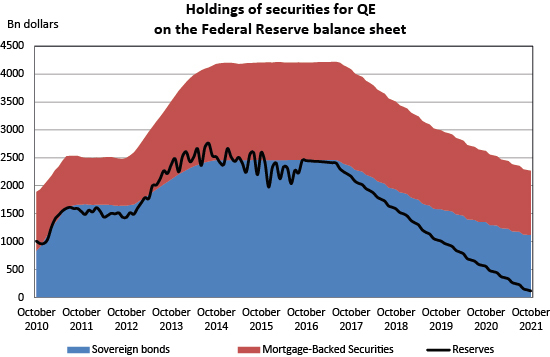 Today, at a time when the QE programmes have not been active since October 2014 and the Fed is no longer creating money to buy securities, it is continuing to hold the size of its balance sheet constant by reinvesting the amounts of securities reaching maturity. The FOMC is to stop this policy of reinvestment “later this year”  and as a consequence begin to reduce the size of its balance sheet. In accordance with the principles for policy normalization published in September 2014 and December 2015, the Fed will not sell the securities it holds, thus on the financial markets it will not modify the equilibrium situation on the stocks but only on the flows. Uncertainty remains as to the rate at which the non-reinvestment will be carried out, depending on the securities concerned by the non-reinvestment and the desired final size of the Fed’s balance sheet. A reading of the minutes of the March meeting also indicates that “participants generally preferred to phase out or cease reinvestments of both Treasury securities and agency MBS”. In January 2017, the Fed’s economists published in FEDS Notes a simulation of the size of the Fed’s balance sheet based on the assumptions set out above. Assuming that non-reinvestment begins in October 2017, and using their data on the assets portfolio held by the Fed, the following graph was developed. These projections show that a non-reinvestment policy implies that the balance sheet will shrink by about 600 billion dollars a year up to October 2019, by 400 billion in the third year and by 300 billion in the fourth year. Treasury bonds will decline by 1.2 trillion dollars while holdings of MBS fall by USD 600 billion. Based on these assumptions, the level of the reserves will be 100 billion dollars in October 2021, i.e. their pre-crisis level, and the Fed will have an equivalent amount of Treasury and MBS debt at that time (approximately 1,100 billion each). The question arises as to the size of the balance sheet that the central bank wishes to return to: the nominal pre-crisis amount, the amount expressed as a share of pre-crisis GDP, or a higher level (with its holding of securities serving its goals of macroeconomic stabilization and financial stability )? By not responding explicitly to this question, the Fed is giving itself the possibility both to adjust its target according to the reaction of the market and to take time to decide what size to target if it wishes to use this instrument on an ongoing basis. The economic and financial impact of a decline this large in the size of the balance sheet could be limited. While private expectations about these changes in the size and composition of the Fed’s balance sheet should affect financial conditions, modifying the balance of supply and demand for financial securities, the various announcements related to this policy normalization have not had any impact as yet. Following the publication of the minutes of the last meetings of the FOMC and of the FEDS Notes describing this reduction policy, there was no reaction in interest rates or the exchange rate for the dollar or on the stock markets. Either the financial markets have not taken this information on board (because it has gone unnoticed or is not credible) or it has already been incorporated into asset prices and future expectations. In other words, it does not seem that the coming reduction in the size of the balance sheet, if it is done on the basis of the mechanisms communicated, will tighten monetary and financial conditions beyond what is expected from the future increases in interest rates, monetary policy’s conventional instrument. If this proves to be the case, normalization would indeed live up to its name. Applied to the euro zone, this would tend to show that an ultra-expansionary monetary policy is not irreversible. Assuming that the US government’s net borrowing requirements will be about 300 billion dollars a year over these four years, the decline in the Federal Reserve’s demand for government securities will be on a similar order of magnitude. This issue has been extensively debated in the academic literature since the implementation of the QE programmes; see among others Curdia and Woodford (2011), Bernanke (2016), Reis (2017). While the reduction in the balance sheet should theoretically mainly affect long-term interest rates, the lack of a response coupled with recent increases in short-term interest rates may result in flattening the yield curve in the United States, and thus reduce the banks’ intermediation margin.